From the bulletin of Saint Andrew Parish, Fairbury Illinois. Fairbury has its own Latin Mass on Sunday’s @ 11:00 AM, with the excellent priest Father Scott Archer. Founders Day Activities: Wednesday, August 24 at 7:15pm – Solemn Tridentine Requiem Mass in the Cathedral for the 100th Anniversary of the Death of Archbishop Spalding. John Lancaster Spalding was born June 2, 1840 in Lebanon, Kentucky. 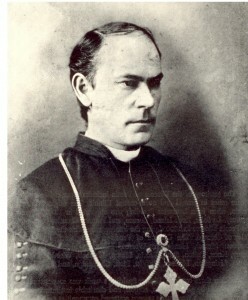 He was ordained to the Priesthood in Louvain, Belgium in 1863. After having studied in Rome for a year he was appointed assistant pastor of the Cathedral in Louisville, Kentucky. In 1866, he established Saint Augustine’s Color Parish in Louisville, KY. He was called to New York to write a biography of his uncle, Archbishop Martin Spalding in 1872, and was later appointed assistant pastor of St. Michael’s Church there. On May 1, 1877, John L. Spalding was consecrated the first Bishop of Peoria, created out of part of what was then the Diocese of Chicago. Shortly after arriving in Peoria, he observed the Franciscan Sisters and their poverty. He requested Mother Xavier to release them to be established as a separate Franciscan congregation and promised he would help them. He directly assisted in acquiring property. On September 30, 1877, he laid the cornerstone and in May of 1878, he dedicated the new St. Francis Hospital in Peoria. Bishop Spalding achieved national prominence for helping President Theodore Roosevelt and J.P. Morgan to end the Great Coal Strike of 1902 as a member of the Arbitration Commission that awarded the miners a retroactive 10% wage increase and reduced daily work hours from 10 to 9. On January 6, 1905 he had a stroke which left him partially paralyzed. He resigned as Bishop of Peoria in 1908 and was elevated to the rank of titular Archbishop of Scythopolis. After his retirement, the priests of the Diocese had a new home built for him near the hospital. This house was later used as the residence for the Bishops of Peoria. This house then became the convent for the Sisters of Saint Francis. Archbishop Spalding died on Friday, August 25, 1916, at 3:45 PM. This entry was posted in Catholic, Catholic Church, History, Peoria and tagged Archbishiop Spalding, Catholic, Catholic Church, Latin Mass, Peoria, Peoria Diocese, Traditional Latin Mass, Tridentine Mass. Bookmark the permalink.